Mexican design collective NEL have designed Global Warming Rug for Spanish textiles brand Nanimarquina. 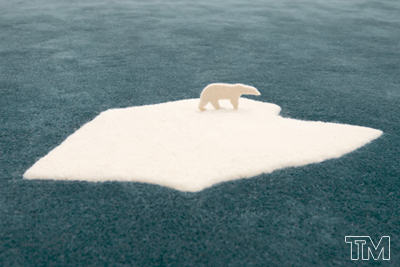 The rug features a felt polar bear on a small iceberg in a large sea of carpet. Following the age-old tradition of using rugs as a means for communication and a cultural record, NEL is portraying global warming in a scene that invites us to reflect on our impact on today’s world. very clever. I like this a lot!